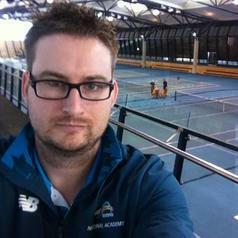 I am a research fellow currently employed by a joint venture between Victoria University's Institute of Sport Exercise and Active Living (ISEAL), the Australian Institute of Sport (AIS) and Tennis Australia. My current research is in the broad field of sports data science/analytics, which aims to use advanced mathematical modelling techniques, often employed in scientific disciplines, to gain insight into professional tennis. I have played tennis religiously since the age of 10, and watching/playing sport of all forms has always been a favourite past-time of mine. The opportunity to apply my mathematical expertise to problems relating to the performance of elite tennis athletes is something i feel is a true privilege. The introduction of technologies such hawk-eye ball tracking, has lead to a rise in the amount of data being collected by sporting institutions. My job is to go further than simple descriptive statistics, and squeeze as much useful information and insight from the data as possible. I studied physics and physical chemistry during my undergraduate and PhD years, which gave me the analytical foundation required for this role. I spent the majority of my PhD looking at data relating to the quantum mechanical nature of molecules, and finding links, trends and interactions present in their unique spectral "finger-prints". My interest are pretty much the aforementioned sport and theoretical physics (particle physics, relativity and crazy fun stuff like that) as well as spending time with friends and family (especially while watching sport! ).